The new Workspace app lives in your Mac's toolbar and offers shortcuts to the rest of your Office 365 apps. With a click you can take a look at your upcoming schedule (viewing up to five of your next appointments), and up to 10 of your most recent documents. The app lets you pin files as well so you can quickly access frequently used ones. You can drop into Skype calls in your meeting appointments as well. 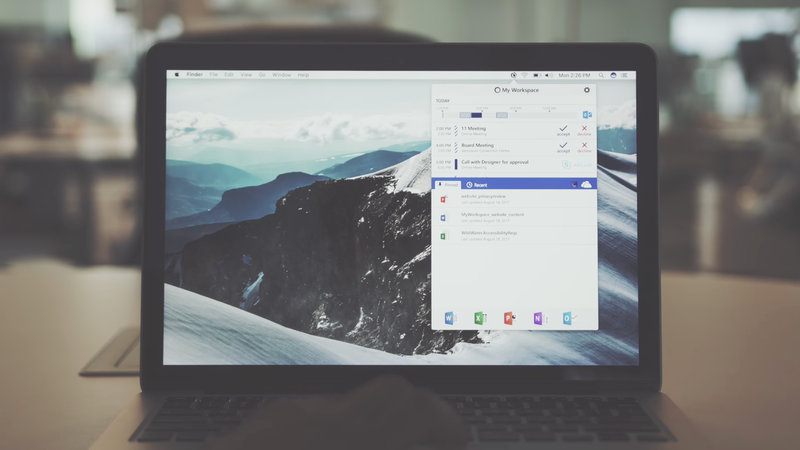 Workspace is the first Mac app from Microsoft's Garage division. The experimental product group has a history of releasing some pretty interesting software, but its track record for supporting that software is hit-or-miss. A favourite Garage-developed app of mine, the Word Flow keyboard for iOS, was recently discontinued in July after its initial release in April 2016 (the page now suggests users check out Microsoft's Swiftkey keyboard).